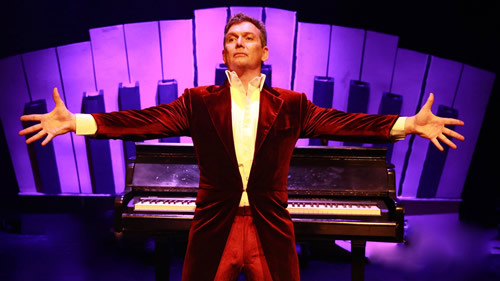 After a highly successful national tour in 2016 South African showman supreme, Ian von Memerty, brought his music review, Keyboard Killers, to the Hilton Arts Festival for two sell-out performances in the well-appointed, 470-seater Grindrod Flagship Theatre at Hilton College. The show features eight musical geniuses who were all masters of the keyboard - they could compose the music, write the lyrics and perform the songs. Dressed in a red velvet tailcoat and trousers, and with white takkies, von Memerty takes his audience on a high-speed journey through the music of Irvin Berlin, Cole Porter, Fats Waller, Noel Coward, Billy Joel, John Legend, Stevie Wonder and Freddie Mercury. Accompanied by the dynamic Devon van Rooyen on percussion and hipster Andrew Warneke who alternated between double bass and bass guitar, von Memerty, in his usual irrepressible manner, performs medleys of some of the best music crafted by these masters. The playlist includes memorable music such as Irvin Berlin’s How About Me? ; Cole Porter’s Anything Goes and Begin and the Beguine, Fats Waller’s Vipers Drag and Ain’t Misbehavin’, Noel Coward’s humorous The Stately Homes of England and Mad Dogs and Englishmen, Billy Joel’s New York State of Mind and Honesty, Stevie Wonder’s Sunshine of My Life and That’s What Friends Are For, John Legend’s soulful anthem Glory and a host of hits from the great Freddie Mercury including Killer Queen, Crazy Little Thing Called Love, Love of My Life, Bohemian Rhapsody and Barcelona. The show offers a wide variety of music of many different styles which von Memerty belts out seamlessly with skill, flamboyance and style. Of course, being a von Memerty production there is no shortage of humour and fun.to go with the music. He bounds energetically about the stage between the medleys relating facts about the artists as well as engaging the audience in chatter and teasing – all done with his trade mark twinkle in the eye. His grand piano has a pivot device which attaches one leg to the floor and he has great fun swivelling the instrument around so that the audience on both sides get a chance to see his hands on the keyboard.